Celia Birtwell has been immortalised by David Hockney in his painting Mr and Mrs Clark and Percy (1970-71), a painting cherished here mostly for the blue vase full of lilies resting on the table. Birtwell’s appearance in this famous painting is by no means her most significant achievement, being a successful and lauded fabric designer in her own right. One would imagine that Birtwell wouldn’t mind too much being upstaged by a plant, as she has celebrated their form and beauty in her patterns throughout her forty-plus year career. Some of her designs, reportedly inspired by Botticelli’s painting La Primavera, can currently be seen in Valentino’s Pre-Fall 2015 collection. We put this to the test, comparing some details on the clothes to the painting itself. 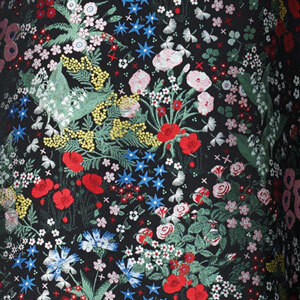 Flora, the Goddess of Flowers, is suitably the most direct source, with isolated full plant specimens seen on her dress almost the same as those found on Valentino’s. 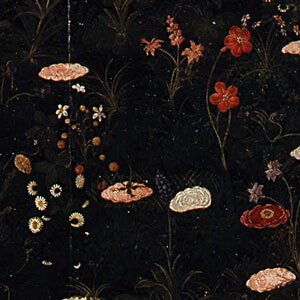 Left (Valentino), right (Botticelli) – direct pattern match, with both depicting isolated botanical specimens that includes blue and pink cornflowers (maybe). La Primavera showing Flora, third from the right. More densely packed florals here, with a diverse plant composition. 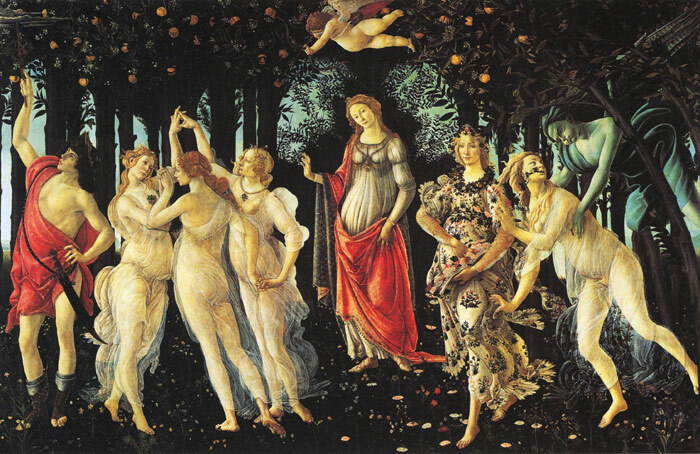 La Primavera is famous for the huge variety of plants depicted. Has anyone noticed it’s not just the botanicals that are the same! Taking inspiration from Flora’s embellished floral neckline.